Alex Chuang is the co-founder and chief strategy officer at Launch Academy, a Vancouver-based, nonprofit tech incubator. Last year was a big year for unicorns. According to Venture Beat, there are now 229 unicorn startups, with $175 billion in funding and $1.3 trillion in valuation. In 2015 alone there were 81 new entrants crowned as the legendary beast. However, the glory did not last. We are starting to see the first signs of a tech slowdown. CB Insight reported startups raised $27.3 billion globally in the fourth quarter of 2015 — $11.4 billion less than what they raised in Q3 2015. We are also seeing a major dip in mega-financing rounds. There were only 38 deals with more than $100 million in financing in Q4 2015 compared to 72 deals in Q3 2015. These findings all raise the question of whether the valuations of unicorns ever made sense in the first place. Many of these companies are now pressured to find new revenue streams. Water bears, or tardigrades, are water-dwelling, eight-legged, segmented micro-animals. They are celebrated as the world’s toughest animal as they have been known to survive in space and withstand freezing temperatures, long periods of drought and high doses of radiation. There’s no better name that’s more fitting for startups that have shown true resilience and have weathered the storm of global economic climate. Water bears are stealthy. They cannot be seen at the moment, but they are preparing for a big comeback. Here are three key things they are focusing on right now. Piggybacking distribution platforms is not a new strategy. We’ve heard how Zynga took advantage of Facebook’s ad network early and achieved the same astronomical growth as Facebook. We’ve also heard how Airbnb reverse-engineered their product into Craigslist and tapped into its 10 million users. But most of these growth stories are no longer applicable because the window of opportunity has closed. What are the new platforms we should be paying attention to? Slack: At its new $3.8 billion valuation, Slack launched an $80 million fund to invest in new app integrations to grow its app directory. With more than 2.7 million daily active users, the team communication company is keen on enabling developers to create bots to help users automate their day-to-day tasks, such as expensing or scheduling meetings. The app ecosystem is still in its infancy stage, which makes it a ripe opportunity to establish first-mover advantage. Workato is a good example of a company that is leveraging Slack’s network to acquire new customers. They created Workbot to help users like H2O.ai sort leads from apps like Intercom, Eventbrite and Dropbox into Salesforce, then cleanse/triage these leads in Marketo so the data is constantly up to date and in sync. Messaging apps: By 2020, 5 billion people on earth will have a smartphone. Many of them will be using WhatsApp (~900 million users), Messenger (~800 million users), QQ Mobile (~860 million users), WeChat (~650 million users) and Line (~215 million users) to communicate. The messaging ecosystem creates endless possibilities for app developers to create tools that will help users collaborate on projects, pay bills, sign contracts, find a date, livestream, bet on sports, play game and more. Virtual reality apps: In the 1980s, the ambition was to have a PC on every desk. Then it was to have a laptop on every lap. Now it’s having a smartphone in every pocket. But could the future hold a possibility where we can have a VR headset for every head? It’s still speculative at the moment as to how VR will reshape the way we interact with information. Perhaps the aesthetics of a VR headset will be much different than what we understand now, but it’s definitely an exciting new space to be in. Hacking customer success for growth requires balancing both the acquisition and retention growth levers. This takes some creativity because you’re trying to increase the customer lifetime value while reducing your churn rate. If you focus too much on user acquisition and neglect retention, you’re stuck in chasing your own tail. And vice-versa; if you focus too much on retention, you’re not growing fast enough for customer advocacy to snowball. This is why success hacking requires a sophisticated understanding of who your customers are, how to segment them and how to empower them to become advocates for your product. Later is an Instagram post management company that has more than 600,000 customers, including brands like Yelp, GQ, Disney, Etsy and Lonely Planet. They were able to achieve this type of growth within a short amount of time because they’re excellent at both optimizing the build-measure-learn cycle and building lasting relationships with their early customers through personalized service. First impressions matters! Nail user onboarding via engaging emails, helpful tutorials, timely support or rewards. Reward customers when they achieve a milestone within your product. Offer virtual high fives, premium features, discounts, credits or badges. Build customer success into the culture of your company by having support rotations so the engineers, marketers, management and designers on your team all get a chance to speak to customers and support them. Are you leaving money on the table? Patrick Campbell, CEO of Price Intelligently, broke the news that “the average amount of time spent on pricing amongst SaaS companies is approximately 8 hours in total.” This is nothing compared to the hundreds, if not thousands, of hours we spend on user acquisition. 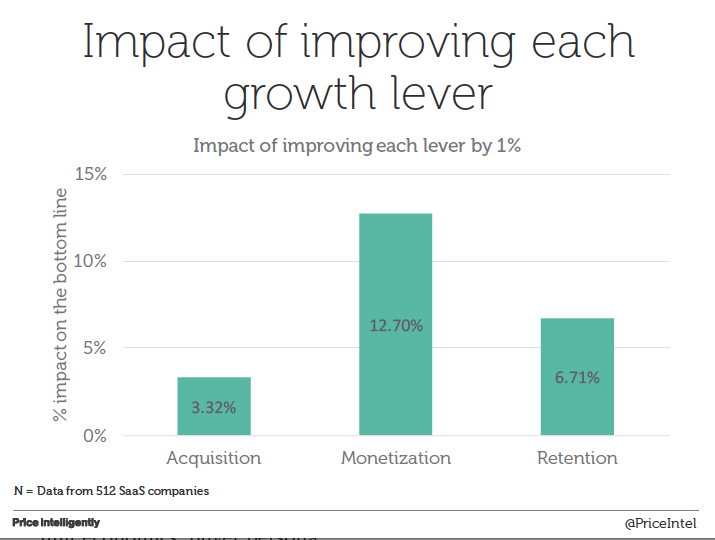 After collecting data from 512 SaaS companies, he found that improving monetization by 1 percent would result in 4X the impact of focusing on acquisition. So how do we improve monetization? Find a persona-pricing fit and get the full picture of your customers, including their most-valued features, least-valued features, willingness to pay, cost of customer acquisition and customer lifetime value. Implement a pricing process where you’re constantly validating your pricing strategy by conducting customer/market research and impact analysis, and by forming a communication plan. Patrick suggested you need to evaluate your pricing strategy every three months and make changes every six months: Utilize a multi-price mindset and align your pricing to your customers’ needs so that they’re only paying for the features that are most valuable to them. A good example of a small team that is monetizing well is Carb.io, a sales productivity tool company that merged with Aaron Ross’s Predictable Revenue. Carb.io spent the majority of its early days understanding how to help salespeople be productive and finding niches where they could have a big impact. They didn’t hit the gas pedal until they had a good understanding of the value that their product brings, and are now nearing $2 million in ARR. Watch Patrick Campbell’s incredible talk on monetization at Traction Conference here. He will be speaking again at Traction Conference in Vancouver on June 23, 2016. The water bears that survive the turmoil of our current volatile markets will be the ones that have equalized all three growth levers (acquisition, retention and monetization) masterfully. They may be small. They may be quiet. But don’t underestimate their tenacity to survive and drive to build products that customers love.